Faculty of Business and Information Technology Student Handbook . which includes information about academic and assessment processes, concerns and complaints, students’ rights and responsibilities, teaching and learning methods and student health and safety. This course is designed help you understand the roles, functions and application of Human Resource Management within contemporary New Zealand organisations. Students will understand the roles, functions and application of human resources management within contemporary New Zealand organisations. Students will evaluate the interrelationship between human resource management, organisations and their environment. Students will develop job documentation for organisational and employment purposes in a given situation. Students will evaluate and select recruitment and selection options for a given situation. Students will understand the role of performance management and its contribution to organisational effectiveness, retention and motivation of employees. Students will apply principles of workplace learning to develop a training programme to meet individual and organisational needs. Students will understand how to develop equitable reward structures from a given set of data and develop a base pay structure. Students will apply an understanding of current legislative requirements for health and safety in the workplace to a given situation. LO2 Apply the principles of job design to organisational effectiveness through collection of appropriate data and in creating a job profile. LO4 Demonstrate understanding of performance management process related to organisational effectiveness, within current legislative requirements. LO6 Develop an effective, equitable rewards structure. LO7 dentify and apply health and safety responses that ensure legal compliance. 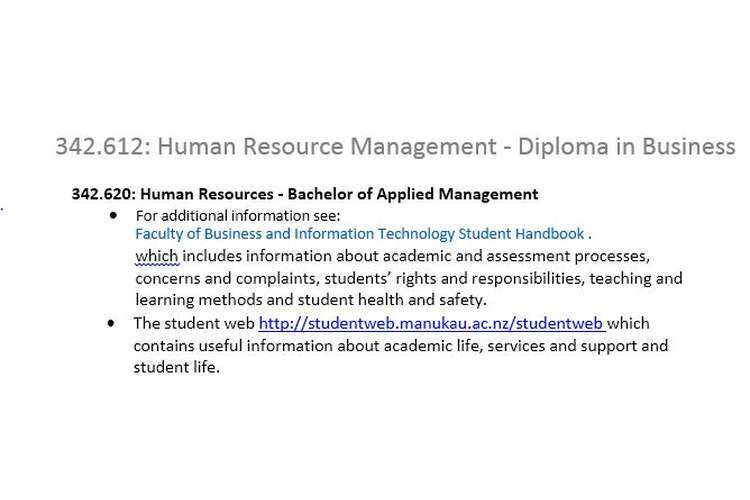 Course Marks - All course marks are available on the Learner Portal https://ebs4Portal-live.manukau.ac.nz. If you have any queries about course work marks you must should these with the lecturer or course co-ordinator concerned within ten days of results being posted. Aegrotats - Aegrotat provisions are intended to ensure students are not unfairly disadvantaged if, for specified circumstances beyond their control, they are unable to undertake an assessment or are impaired in the completion of an assessment. Aegrotat applications must be made within five working days of the date on which the assessment was due or the date of the test or examination. For further information refer to the student regulations, or go to the Faculty Reception, or phone the Faculty on 09 975 4564. Not all courses or assessments have aegrotat provisions. If for some reason you are unable to continue with your course of study, please contact the Programme Leader. If you are unable to complete your course please read the information regarding cancellations, withdrawals and transfers contained in the student regulations. For more information refer to the student regulations or contact the Faculty of Business and Information Technology office. may make and use audio and/or video recordings of classes for educational and associated administrative purposes. In doing so, the images, likenesses, and/or voices of persons attending and/or otherwise participating in classes (including lecturers, students, visitors, etc) may be recorded and securely stored for the purposes of the course and for archive purposes. By attending and/or otherwise participating in classes you consent to the use of your image, likeness, and voice in such audio and/or video recordings and acknowledge that owns all copyright, moral rights, and other intellectual property rights in audio/visual class recordings and further acknowledge that students enrolled in the course, and other persons authorised in connection with the course, are given a limited licence to access and copy class recordings for their personal study only. Class recordings may be stored and distributed to enrolled students and other authorised persons by any technology (including but not limited). Pursuant to the Privacy Act 1993, you are entitled, at any time, to request access to, and (if necessary) correction of, any personal information held about you. MIT is committed to providing a safe and productive learning environment. We all have a role in contributing to this positive environment. MIT has policies and procedures in place to ensure these standards are maintained so that everyone can feel safe and respected. Faculty of Business and Information Technology Student Handbook. MIT is committed to providing an environment free from sexual, racial and other forms of harassment. MIT will neither tolerate nor condone harassment of staff, students or members of the public. Harassment will be dealt with in accordance with the MIT Harassment Policy. takes complaints seriously and is committed to providing students with access to fair, effective and culturally appropriate procedures for resolving complaints. Complaints will be dealt with in accordance with the Complaints Resolution Policy. Initially you should raise concerns informally with the appropriate staff member. For example if you have a concern about your course, the appropriate person might be your course lecturer, then your programme leader. Incidents of misconduct will be addressed to ensure that maintains the highest academic standards and provides and safe and effective learning environment. Please refer to pages 31-36 of the student regulations for information about student misconduct, and to pages 51-53 for definitions of misconduct, misconduct during assessment and examples of behaviours that constitute misconduct.